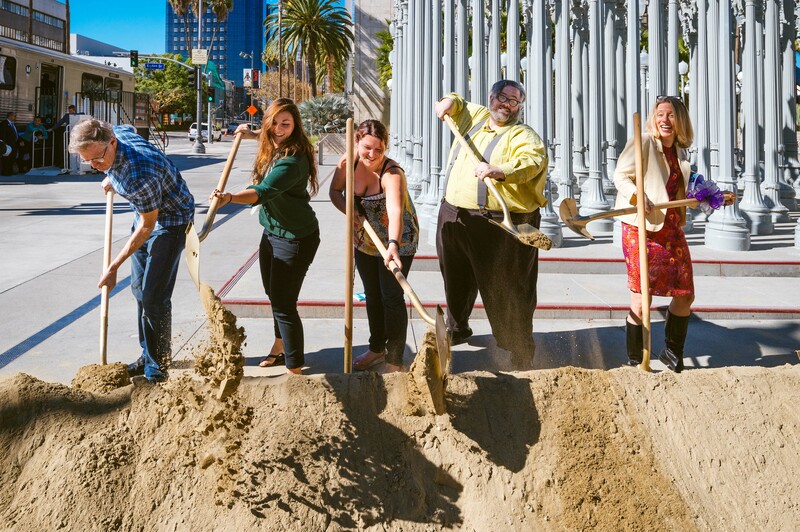 Nice to see some civilians taking a turn at the shovels for a major public works project — in this case our friends at Los Angeles Magazine who work just down the street from the Purple Line Extension’s future Wilshire/Fairfax Station. They wandered over to LACMA this morning for this photo op, which we were more than happy to provide. Magazine staff will have a front row seat as construction proceeds the next few years. I have seen maps that call the link between the I-105/Green Line at Norwalk to the I-5 and or Norwalk Metrolink Stn a “candidate corridor”, but I believe right now it would cost more money than the benefits the County as a whole would receive. That is sand (with a bit of rock contamination), not ‘dirt’. There is a difference. LOL Steve! I almost spit the beer I was drinking all over my keyboard. Best comment of the day! To be very precise, the soil used at the Groundbreaking (although I did not do a definitive test, was most likely a “Loamy Sand” or “Sandy Loam” from what it looked like to me and the classification triangle found at the link above.